1 Facultad de Ciencias Agronómicas y de los Alimentos, Pontificia Universidad Católica de Valparaíso. Calle San Francisco s/n, La Palma, Quillota, CHILE. Correo-e: cata.macka@gmail.com (*Autor para correspondencia). 2 Facultad de Ciencias Agronómicas, Departamento de Producción Agrícola, Universidad de Chile. Santa Rosa 11.315, La Pintana, Santiago, CHILE. In Chile, avocado cultivation has incorporated the use of uniconazol-p via irrigation in plantations where rootstocks from seed predominate. This study suggested that the effectiveness of applying uniconazole-p to the soil base of 'Hass' avocado trees depends on the origin of the rootstock. 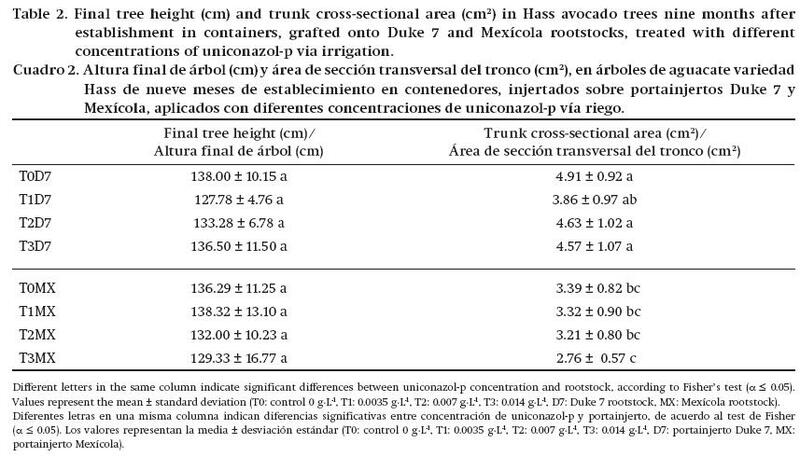 Nine-month-old 'Hass' trees were used in Duke 7 clonal rootstock and Mexícola rootstock from seed, together with 0, 0.0035, 0.007 and 0.014 g·L-1 uniconazol-p. Measurements were made in the canopy of the plants, at the level of vegetative growth, bud development and earliness in flowering. It was found that the differences among variables were at rootstock level; Duke 7 showed greater vigor and earlier flowering than trees with Mexícola. In addition, Duke 7 had no response to the application of uniconazol-p, contrary to what was presented by Mexícola, where the uniconazole-p concentration above 0.007 g·L-1 showed no effect on either shoot length or the proportion of potential flower buds in relation to the total number of buds. Keywords: Persea americana Mill., triazole, high density, Duke 7, Mexícola. En Chile, el cultivo de aguacate ha incorporado el uso de uniconazol-p vía riego en plantaciones donde predominan los portainjertos provenientes de semilla. El presente estudio planteó que la efectividad de la aplicación de uniconazol-p al suelo, en árboles de aguacate 'Hass', depende del origen del portainjerto. Se utilizaron árboles 'Hass' de nueve meses de edad en el portainjerto clonal Duke 7 y el proveniente de semilla Mexícola, junto con 0, 0.0035, 0.007 y 0.014 g·L-1 de uniconazol-p. Se realizaron mediciones en el dosel de las plantas, a nivel de crecimiento vegetativo, desarrollo de yemas y precocidad en la floración. Se observó que las diferencias entre variables fueron a nivel de portainjerto; Duke 7 presentó mayor vigor y adelanto en la floración que los árboles con Mexícola. Además, Duke 7 no tuvo respuesta a la aplicación de uniconazol-p; caso contrario a lo presentado por Mexícola, donde la concentración de uniconazol-p mayor a 0.007 g·L-1 no mostró efectos en el largo de brotes, ni en la proporción de yemas potencialmente florales con relación al total de yemas. Palabras clave: Persea americana Mill., triazol, alta densidad, Duke 7, Mexícola. In Chile, commercial avocado growing dates back to the 1960's (Gardiazabal & Rosenberg, 1991), initially with native varieties and later with imported varieties. Currently, rootstocks from seed are widely used. In addition, various technologies have been introduced to increase productivity, for example, the use of molecules to inhibit gibberellin biosynthesis. At rootstock level, those from seed are the most used, accounting for 99.51 % by 2010 (Anuario Asociación Gremial de Viveros Frutales [AGVF], 2011). These rootstocks have high variability due to their heterozygosity, added to which they come from non-isolated parental orchards and soils that are highly non-uniform; the above results in heterogeneity in tree growth in the field (Ben-Ya'Acov & Michelson, 1995; Lemus et al., 2005). For their part, clonal rootstocks are plants identical to the mother plant (Lemus et al., 2005), and therefore present a high degree of uniformity (Mickelbart, Robinson, Witney, & Arpaia, 2012). Within the gibberellin biosynthesis inhibitors are compounds with a heterocyclic ring with nitrogen (Rademacher, 2000).This group includes uniconazol-p, a triazole. Uniconazol-p inhibits endogenous biosynthesis of gibberellins (National Registration Authority for Agricultural and Veterinary Chemicals, 2000), through interference in the activity of cytochrome P450. This process inhibits the activity of the enzyme ent-kaurene oxidase, which prevents oxidation of ent-kaurene to ent-kaurenoic acid (Azcon-Bieto & Talón, 2000; Rademacher, 2000; Saito et al., 2006; Sasaki et al., 2013; Tai-Ping, 2011). By using gibberellin biosynthesis inhibitors, plant development, yield, carbohydrate content, foliage density and earliness in flowering, among other variables, are affected (Fletcher, Gilley, Sankhla, & Davis, 2010; Jiao, Wang, & Tsujita, 1991; Katz et al., 2003; Schneider, Goldway, Birger, & Stern, 2012; Zeller, Larsen, Higgins, & Curry, 1991). But there is no clarity with respect to the concentrations to use, since highly variable concentrations of uniconazol-p (as active ingredient) have been handled, ranging from 0.001, 0.003, 0.01, 0.1, 0.25, 0.5, up to 1 g·L-1 (Jiao et al., 1991; Katz et al., 2003; Schneider et al., 2012; Stern, Raz, Applebaum, Meiri, & Goldway, 2009; Zeller et al., 1991). It is a factor of utmost importance, especially when dealing with applications via irrigation, as it is applied directly to the root zone and is transported acropetally via xylem (Davis, Steffens & Sankhla, 1988; Lever, 1986). Furthermore, as stated by Menzel and Le Lagadec (2014), these chemical products persist for a long time in the tree and soil, so the concentrations should be handled carefully to avoid delays in tree growth over the long term. Considering the current conditions of avocado cultivation in Chile, where the vast majority of orchards are established on rootstocks from seed and there is no clarity on the uniconazol-p concentrations applied via irrigation to this species, it is appropriate to investigate the responses that the use of two rootstocks of different origins with different concentrations of p-uniconazol would have on the canopy of the trees. It is hypothesized that the effectiveness of applying uniconazol-p to the soil base of Hass variety avocados depends on the type of rootstock. Based on this hypothesis, the aim of this study was to determine the effects of the combination of four concentrations of uniconazol-p applied via irrigation, and the use of clonal or seed-derived rootstock on the growth of the canopy of young Hass avocado trees. The trial took place at the La Palma Experimental Station, belonging to the Pontificial Catholic University of Valparaiso in Quillota, Chile (32° 53' 30.13" SL; 71° 12' 21.35" WL). The area has a temperate mesothermal estenothermic semiarid Mediterranean climate (Santibáñez & Uribe, 1990). In September 2012, two-year-old avocado trees were established in 98-L plastic containers measuring 50 cm in diameter by 50 cm in height, filled with clay loam soil characteristic of the area. Hass avocado trees of similar vigor, grafted onto two types of rootstocks, namely Mexícola (from seed) and Duke 7 (clonal), both of Mexican race, were selected. Two applications of commercial product Sunny® (5 % uniconazol-p), corresponding to 50 g·L-1 active ingredient, were made to the soil at different concentrations (Table 1). The first application was carried out in the summer of 2013, ending the period of spring shoot growth. The second application was made in the autumn of that year, to cover the second period of growth. These applications were made according to current management practices, i.e. summer and fall applications to stimulate flowering and reduce tree vigor. Measurements began to be made at nine months after establishing the trial. In total, 48 trees were used. In treatments with rootstock from Mexícola variety seed, eight replicates were used, while there were only four with Duke 7 rootstock. Treatments with Mexícola rootstock have more replicates since the rootstock comes from seed and therefore would have greater variability. A 4 x 2 factorial arrangement (two rootstocks and four concentrations of uniconazol-p) was used to determine the combined effect of the factors (Table 1). A completely randomized experimental design was used. The active ingredient doses used were 0, 0.0035, 0.007 and 0.014 g·L-1, corresponding to 0, 1, 2 and 4 L·ha-1 of commercial product. Of the corresponding concentration, 10 L per tree were applied. The concentrations were calculated considering a plantation of 1,600 trees·ha-1 (2.5 m x 2.5 m), since the use of uniconazol-p is recommended for high-density plantations. During the winter shutdown (June 2013), the total height of each tree was measured with a retractable tape measure. It was made from the neck of the tree to its apex. The results were expressed in centimeters. The total number of shoots produced in two randomly-selected trees per treatment was counted. Subsequently, the length of the totality of shoots produced in the same trees was measured with a digital Vernier caliper (Decrescent® brand, PRC-7587-EDVC-V1 model). The measurement was made from the shoot base to its apex. The result was expressed in centimeters. To establish the evolution in the development of potential flower and vegetative buds, the equatorial diameter of 10 % of the buds of each tree in the trial was measured with a digital Vernier caliper (Decrescent® brand, PRC-7587-EDVC-V1 model). Measurements were made in June, July and August 2013 (winter shutdown and beginning of the differentiation period). Measurement was halted in September, when buds reach state 513 on the BBCH scale for avocado, i.e. reproductive bud break (Alcaraz et al., 2013). An 80 % shade mesh was placed around the trunk of three trees per treatment. During the beginning of the flowering season, flowers were collected twice a week. Flowers were separated by week and dehydrated in an oven at 60 °C. A known sample was weighed and, from it, the number of flowers produced by the trees in the first two weeks of flowering (September) was estimated. For each variable, ANOVA and Fisher's multiple comparison test (α ≤ 0.05) were performed for eight treatments using the Minitab 16 statistical package for Windows. The variable final tree height showed no differences in relation to the factors rootstock and uniconazol-p concentration young trees nine months after establishment (Table 2). The trunk cross-sectional area showed differences in relation to the rootstock used, regardless of the uniconazole-p concentration (Table 2). Trees grafted onto Duke 7 rootstock had a larger trunk cross-sectional area than trees grafted onto Mexícola. Reddy, Kurian, Ramachander, Singh, and Kohli (2003), by performing correlation studies, found that trunk cross-sectional area is a good indicator of vigor and cumulative fruit yield during the first 16 years in mango; based on responses like this, greater vigor can be attributed to trees grafted onto Duke 7. In addition, the results obtained in the present study are consistent with those of other studies, where avocado trees grafted onto Mexícola rootstock had a smaller trunk cross-sectional area compared to other rootstocks, including the clonal type (Gregoriou, 1992). The reduction in trunk cross-sectional area could be explained by considering the results obtained in apple trees by Atkinson, Else, Taylor, and Webster (2001), who suggest that morphological and anatomical changes are produced at the point where the graft is performed, resulting in a discontinuity of vascular tissues. There could also be differences between rootstocks at root level, since, for example, Fassio, Heath, Arpaia and Castro (2009) determined that the roots of the Duke 7 rootstock develop wider xylem vessels and a larger conductive tissue area than Toro Canyon rootstock. Solari, Johnson, and Dejong (2006) suggest that the effect of the rootstock on vegetative growth in peach trees is associated with water balance relations, specifically in the hydraulic conductance of the rootstock vascular system. Thus, larger-diameter xylem vessels explain the greater vigor expressed as trunk cross-sectional area. 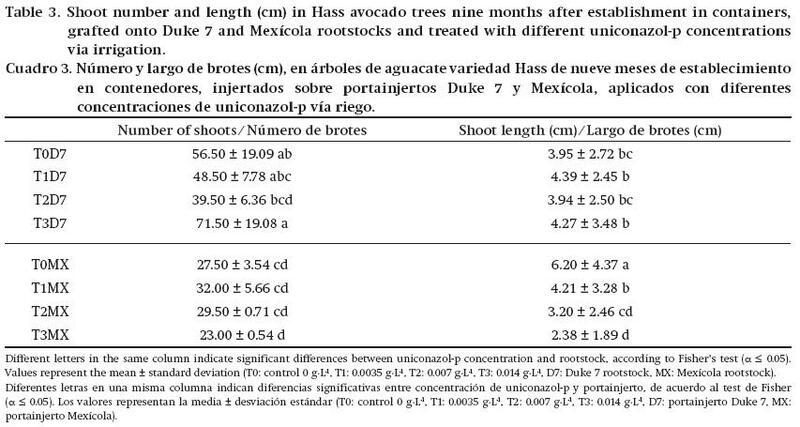 In the variable number of shoots per tree, it was found that while there is no clear relationship between the combined effect of rootstock and uniconazole-p dose, trees grafted onto Duke 7 rootstock developed a larger number of shoots than those grafted onto Mexícola (Table 3). Like the trunk cross-sectional area, they would be mainly determined by the anatomy of the rootstock and the vigor that it exerts on the tree. Shoot length presented dissimilarities at rootstock level. According to Solari et al. (2006), inequalities in shoot growth rates seem to correspond to differences in water potential at trunk level between rootstocks. On the other hand, the shoot length developed in trees grafted onto Duke 7 showed no differences among uniconazol-p concentration levels (Table 3). These results are similar to those of Zeller et al. (1991), who studied the effect of different rootstocks and a range of uniconazol-p concentrations greater than those used in this study (between 0.001 and 1 g·L-1) on 'Golden Delicious' apple trees. They observed no statistical differences in percentage reductions in shoot length among the concentrations. In trees grafted onto Mexícola, the tendency for shoot length to decrease as the uniconazol-p concentration increased was observed (Table 3). However, there was no difference in applying 0.007 or 0.014 g·L-1 uniconazol-p (equivalent to 2 and 4 L·ha-1 uniconazol-p at 5 %). This behavior would allow reducing the uniconazole-p concentration without altering the effect of restricting shoot length, targeted against the intense vegetative growth possessed by avocado (Whiley, Schaffer, & Wolstenholme, 2002). 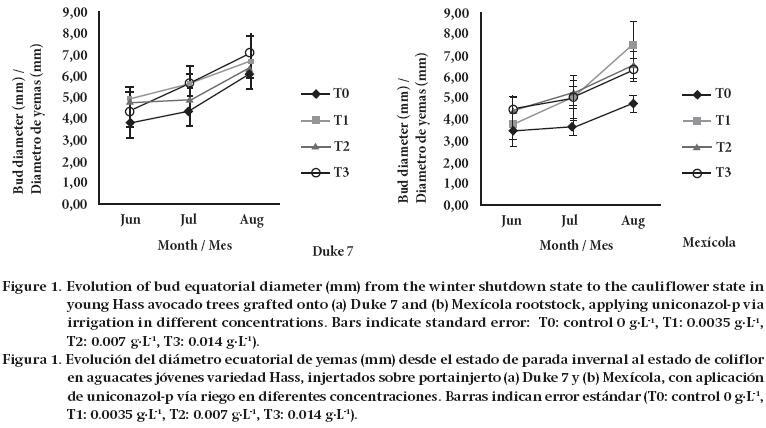 Observing the vegetative growth responses as a whole, it appears that Duke 7 rootstock increases canopy vigor compared to Mexícola, resulting in trees of similar height but with a larger trunk cross-sectional area and greater shoot number and length. In fact, almost all commercial rootstocks used in the world are vigorous, a trait that confers certain tolerance to root rot caused by the fungus Phytophthora cinnamomi. Duke 7 is the second most widely used commercial rootstock tolerant to Phytophthora, after the Dusa rootstock (Menzel & Le Lagadec, 2014). Differences in vigor among rootstocks could be explained by considering the above-mentioned vascular development through the dissimilarity conferred by rootstocks on nitrogen mobilization and the amount of free amino acids, determined by the genetic potential of the rootstock Holzapfel & Treeby, 2007; Lee & Steenwerth, 2011; Sorgonà, Abenavoli, Gringeri, & Cacco, 2006; Treeby, Holzapfel, Waler, & Nicholas, 1998). In assessing the variables total number of buds and number of potential flower buds, there was a greater quantity in trees grafted onto Duke 7 rootstock than in trees grafted onto Mexícola (Table 4). 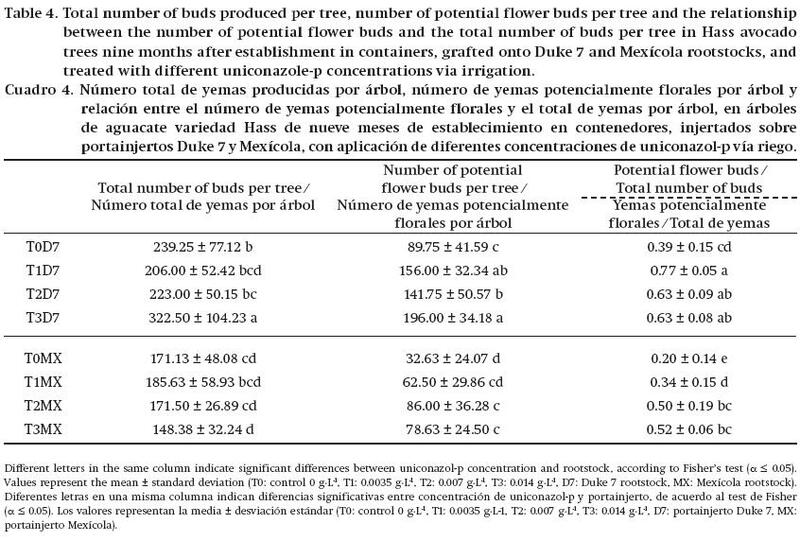 Also, by establishing the relationship between the number of potential flower buds per tree and the total number of buds per tree, trees grafted onto Duke 7 had a higher proportion of potential flower buds than those grafted onto Mexícola (Table 4). In another study, Kremer-Köhne and Köhne (1992) found that the combination of Duke 7 rootstock with Hass variety stood out compared to other combinations used in the study, in terms of productive precocity; i.e. increased production with younger trees (as in this study) and higher yield. Additionally, this behavior can be influenced by different capabilities possessed by rootstocks to absorb and transport nutrients to the aboveground part of the tree, as the rootstock and variety contribute to shoot growth and productivity (Herrera-González, Salazar-García, Gutiérrez-Martínez, & González-Durán, 2013; Zijlstra, Groot, & Jansen 1994). It was determined that the number of potential floral buds, by comparing with the Duke 7 control treatment (0 g·L-1 uniconazol-p), showed no differences with respect to trees grafted onto Mexícola where uniconazol-p (concentrations of 0.0035, 0.007 and 0.014 g·L-1) was applied. Regarding the relationship between the number of potential floral buds and the total number of buds, in both rootstocks applying uniconazole-p increased this ratio significantly. For Duke 7, the three doses used had the same effect without statistically differing, and because of that they had no differences either in shoot length; therefore, the lowest dose is recommended. However, with Mexícola the 0.007 and 0.014 g·L-1 doses had the best results, both in the ratio of potential flower buds to total buds and in shoot length. In the evolution of bud equatorial diameter, the transition from vegetative to reproductive meristems is found, that is, the floral differentiation phase, where buds are widened due to the formation of new structures (Kitsaki, Andreadis, & Bouranis, 2010; Mert, Baruk, & Ipek, 2013). However, in August, for control trees grafted onto Mexícola (without uniconazole-p application), no effect was seen in terms of bud widening (Figure 1). 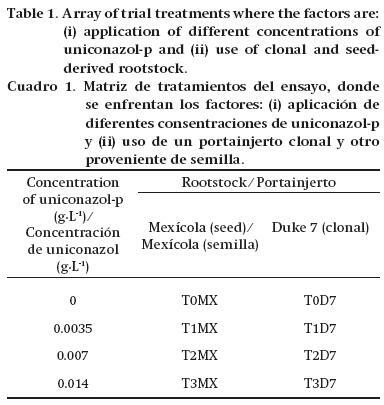 Therefore, Duke 7 rootstock exerts no response on the canopy after uniconazol-p application, but in trees grafted onto Mexícola, the treatment gave the same diameter as that accorded by Duke 7. Trees grafted onto Duke 7 flowered earlier than those grafted onto Mexicola. This is contrary to the findings reported by Mickelbart et al. (2012), who detected no differences in precocity or duration of flowering in trees with different rootstocks. However, Wang, Gould, and Patterson (1994) determined that in kiwi there are rootstocks that tend to favor flowering; these trees tend to develop a greater trunk cross-sectional area in the productive variety, giving them larger xylem vessels than rootstocks that do not promote flowering; this may have happened in this trial, since Duke 7 accorded a greater trunk cross-sectional area to the trees grafted onto it. In the first flowering period (first week), trees grafted onto Duke 7 and treated with 0.007 and 0.014 g·L-1 uniconazol-p (doses of 2 and 4 L·ha-1 uniconazol-p at 5 %) flowered, while the control and 0.0035 g·L-1 (doses of 0 and 1 L·ha-1 uniconazol-p at 5 %) treatments did not flower in the same period (Figure 2). In the second week of measuring, trees grafted onto Mexícola did not flower. However, it began in the control trees and those treated with 0.0035 g·L-1 grafted onto Duke 7. At the highest concentrations (0.007 and 0.014 g·L-1), greater flowering intensity was observed. Conversely, Stern et al. (2009) reported that the intensity of flowering in cherry trees is independent of the uniconazol-p application, finding no significant differences with respect to the control. Katz et al. (2003) determined that applying uniconazole-p reduces the rate of vegetative growth and increases the availability of assimilates for the developing reproductive apexes, stimulating floral induction. In the aforementioned study conducted on Globularia sarcophylla (cut flower), plants with uniconazol-p application flowered 40 days earlier. Also, Abdel-Rahim, Elamin, and Bangerth (2011) established that the application of paclobutrazol in mango varieties that went through two unproductive years produced similar trends to the phytohormonal changes that occur in floral induction, by influencing the concentration of cytokinins, abscisic acid, gibberellins and auxins. The behavior of the trees in this trial that were treated with uniconazol-p could be linked to the same principles that produce the aforementioned response in mango. Finally, the early response and precocity of flowering in trees after applying uniconazol-p should be taken into account, since flowering may be affected by late winter frosts, as occurred in this trial, and trees with a large number of flowers do not necessarily have a lot of full fruit. Similar yields have been observed with and without application of both paclobutrazol and uniconazol-p, with those that regulate vegetative growth being more effective (Blumenfeld & Gazit, 1974; Menzel & Le Lagadec, 2014; Stassen, Snijder, & Donkin, 1999). The rootstock has a marked effect on tree vigor and earliness of flowering, with Duke 7 being more vigorous and precocious than Mexícola. The use of uniconazol-p in young 'Hass' avocado trees grafted onto Duke 7 does not diminish vegetative vigor, as occurs with Mexícola. This treatment induces flowering directly proportional to the concentration in <Hass> avocado trees grafted onto Duke 7 rootstock. 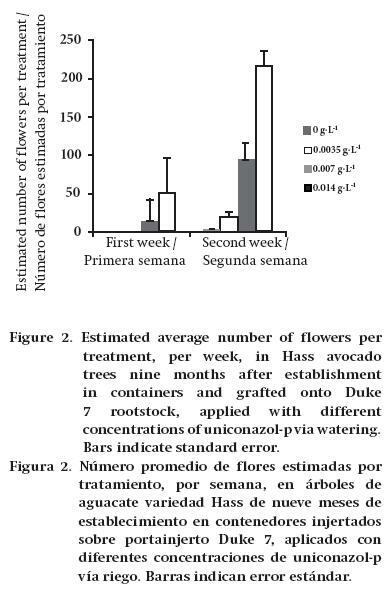 In young <Hass> avocado trees grafted onto Mexícola rootstock, uniconazol-p concentrations of 0.007 and 0.014 g·L-1 (2 and 4 L·ha-1 respectively) exert the same effect on shoot length and percentage of potential flower buds.